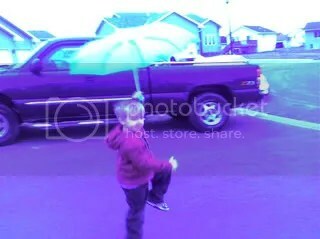 Last week, as the snow ended and the rain began in Minnesota, my son decided that he needed an umbrella. So, I told him on Friday that he could get one on Saturday if he was good for the night. Good of course equals eating ones vegetables and brushing ones teeth and going to bed without fuss on time. He knocked the first two requirements out without effort. When it came to bedtime, he had difficulties. My boyfriend Tim aka tg was over and when I told Max it was bed time and he resisted as he always does, I said in a stern voice, “You better be good if you want an umbrella tomorrow.” Well, without knowing the story behind it tg laughed as hard as he could. I mean, I just promised my offspring shelter from the rain as though it was a luxury, so I couldn’t blame him. Max has the umbrella now, he loves it. He uses it whenever he is outside just in case rainclouds appear instantaneously. It’s fun to bribe kids with necessities. Although I understood what you were going for, before I had read more than a few sentences, I too laughed to myself about the idea that some kid out there was being extra good to get something most of us don’t even like to lug around even when we do need one. Also, it’s probably just my pc because my pc been doing stuff like this lately but there might be something going on with your site. If anyone else is experincing problems, particulary slowness and web browser crashing, you might want to check it out. Oh classic. I’m with tg, that is a lol moment. doho- WordPress has had some issue the last few days, it’s not just you. Yes mom, but we were never an ‘umbrella family” to begin with. Use a raincoat as incentive for another well-behaved day and Greg’s caption would be even more appropriate. And c’mon…when else can a guy wear a yellow raincoat other than childhood (and movies)? Thanks greg, I was thinking that too. Michael, I should do that. He would probably love it.